Happy 2018 from the Karlsson Lab! Our holiday card is out, featuring the remarkable illustrations of Kathleen Morrill. In this year’s card, we set out as intrepid explorers to swab and sequence the fantastic beasts of lore (and poke gentle fun at our far-ranging projects and diverse mix of species). This year’s card is accompanied by our field guide “Fantastic Beasts and How to Swab Them”. When people hear that I am a veterinarian, they are often surprised to learn that I work in a genetics lab, rather than in the clinic with a white coat and a stethoscope. I began studying the genomic basis of cancers in dogs when I was in veterinary school because I wanted to help further translational research – that is, I wanted to help make discoveries that could be translated into new clinical treatments and diagnostics for pets. Along the way, I have come to understand that this research is also important from a comparative medicine perspective: understanding cancer in dogs can also teach us about cancer in people. It’s a win-win scenario! In this post, I’d like to give you a brief overview of how our lab studies cancer in dogs, and hint at a few exciting new studies that we will be starting in the near future! One way that we study cancers in dogs is by looking for genetic risk factors that predispose them to developing cancer. Genetic risk factors for cancer tend to run in highly related dog breeds, meaning that these risk factors are passed down (inherited) from generation to generation. This is somewhat similar to how cancers can run in human families – for example, you may have heard about how individuals in families with an inherited mutation in a BRCA gene often have an elevated risk of breast, ovarian, or prostate cancer. When we look for inherited risk factors, we search the entire genome for regions that contain mutations with different frequencies in dogs with and without cancer. This is called a genome-wide association study. These regions harbor genetic variants that affect the risk of developing cancer. We work with collaborators to understand the inherited risk factors behind multiple cancer types. Interestingly, risk factors for a given cancer sometimes differ across breeds who all get the same cancer type. For example, we’ve shown that three breeds predisposed to osteosarcoma have different genetic risk factors, but these risk factors impact genes that work together. Studying whether carrying these risk factors can predict the development of disease or how the disease will act clinically will aid in developing new diagnostic tests. In addition, we are continuing to investigate what these genetic changes are doing at the cellular level that is leading to cancer. Knowing this will help to better understand the underlying disease and potentially to develop new therapies in the future. It is now well-known that exposure to certain agents called carcinogens (think tobacco smoke, asbestos, or radiation, to name only a few) can increase the risk of developing cancer. Because our dogs live in the same environment as we do, studying how these agents affect the risk of cancer in our dogs not only helps us to keep them safe, but can also help to identify agents that may be harmful to humans. Tobacco smoke is one example of a shared environmental exposure leading to cancer. One of the best-known risk factors in human respiratory tract cancers, it has been shown to increase the risk of nasal and sinus cancer as well as lung cancer in dogs. Because many dogs live their entire lives with the same owner in the same house, their exposure to certain types of carcinogens can be tracked, either with owner questionnaires or with publicly available information on pollution levels and other risk factors in the area that they live. In addition, recent research has shown that silicone rubber (you know, those LIVESTRONG bracelets?) can be used as a passive sampler to track exposure to various compounds. We are excited to be planning a pilot study looking at whether silicone collar tags can be used to track environmental exposure levels of various compounds in dogs, so stay tuned for that! In addition to inherited mutations, we are also interested in mutations that occur during the lifetime of a cell, called somatic mutations. These can arise from either genetic (for example, faulty DNA repair genes) or environmental (carcinogen exposure) causes. This type of mutation is what is being referred to when doctors perform sequencing of a tumor. Somatic mutations are important in understanding the behavior of a tumor clinically. Two important types of gene that are frequently mutated in cancers are oncogenes and tumor suppressors, and these are often described using the analogy of the cell as a car. Oncogenes are like the gas pedal – the tumor wants to go fast, meaning that it wants to proliferate and divide. A mutation in an oncogene causes the gas pedal to be stuck down, and cells proliferate out of control. Tumor suppressors, on the other hand, are like the brakes in this analogy – these are genes that can stop uncontrolled cell division and induce apoptosis (cell death). Many cancers disable the brakes through mutation or deletion of these tumor suppressor genes. Traditionally, cancer has been treated in three ways: surgical removal of the tumor, irradiation of the tumor site, and chemotherapy, which targets all fast-dividing cells. But cancer cells aren’t the only ones in the body that divide fast. This is also true for hair, immune cells and the cells lining the gut. The fact that the chemotherapy also harms these cell types leads to side effects such as increased risk of infection, nausea, and sometimes hair loss. Recently, however, new drugs called “targeted therapies” have begun to be designed. These drugs can target cancer cells with a particular mutation, and spare the normal tissue. Going back to our car analogy, it’s as if knowing how the cancer disabled the brakes allows us to selectively re-engage them, rather than having to target all fast-moving cars. This is one of the goals of precision medicine – to be able to sequence a patient’s tumor and select a targeted therapy specifically designed for the mutations in that tumor, without causing damage to the normal tissue. There are a number of targeted therapies already in use in human medicine, for example, the drug vemurafenib targets a mutation in a gene called BRAF in patients with melanoma. A few have been approved for use in veterinary medicine, for example, toceranib is used to treat dogs with mast cell tumors. The more we know about the underlying mutations in different types of cancer, the better we can design targeted therapies for these mutations and help to treat more patients. Dogs will be important in this effort both for veterinary medicine and for human medicine, as many cancers that are rare in people are actually common and more easily studied in dogs. In order to sequence somatic mutations, we need to be able to sample the tumor’s DNA. Usually, this means that a tumor biopsy must be performed, and DNA prepared directly from a portion of tumor tissue. Recent advances in sequencing techniques are allowing researchers to sequence the tumor from fragments of DNA floating in the bloodstream, rather than having to physically sample the tumor itself so that the patient doesn’t need to undergo surgery. 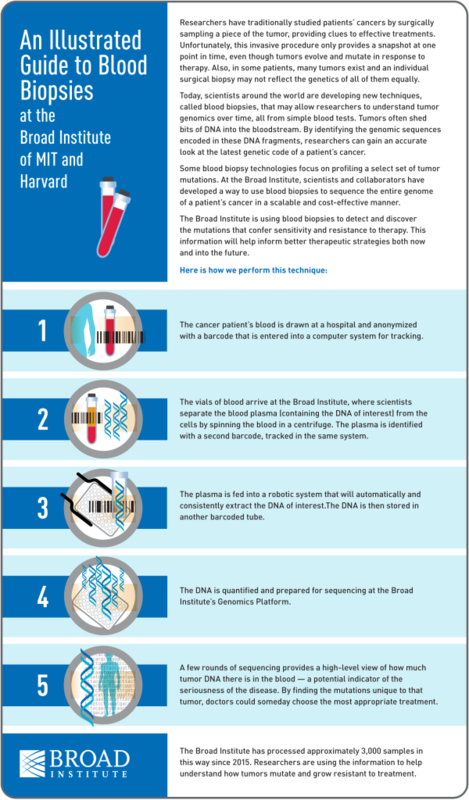 This technique, called “liquid biopsy,” opens up many possibilities, including improved diagnostic tests, repeated sampling of tumor DNA over the course of therapy to monitor response and development of chemotherapy resistance, and monitoring patients in remission for signs of relapse. We are very excited to be piloting the use of this technique to sequence tumor DNA in dogs, with the help of the Adalsteinsson lab, who are pioneering this technique at the Broad Institute. Stay tuned for more information on this pilot study as it unfolds! This has been a bit of a whirlwind tour of some the things we look at now and are planning to look at in our canine cancer studies. I hope to write in more detail about some of these topics in the future as we embark on our new studies and publish new findings. I am a new face at Karlsson Lab, the lab behind Darwin’s Dogs. I finished my Ph.D. this summer and started here as a postdoc in September. When I arrived, our fearless leader Elinor announced that she had just started up an exciting new project and that she wanted me to be its team leader. On my first day I was suddenly swimming (though not quite drowning) in a wash of information about the new Working Dog Project. Environment (how these dogs are raised and trained) certainly has a lot to do with which dogs succeed and which fail, but so does genetics, and genetics is what we do at Karlsson Lab. So we’re diving in to the problem of figuring out the genetics affecting success and failure in working dogs. 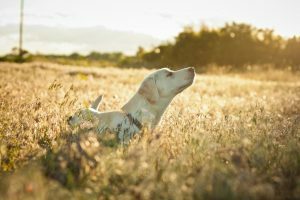 The predisposition of a dog to succeed in any given working dog program is the very definition of a “complex trait”: a trait affected by many different genes, interacting with each other and with the environment in unpredictable ways. These are the types of problems that attract our lab; we also study cancer and OCD, which are also both great examples of complex traits. Understanding the genetics behind these kinds of traits is super difficult, because untangling the effects of genetics and environment is not a straightforward problem. The approach Karlsson Lab takes to most of these complex trait problems is sample size: get as many samples as possible and hope that they swamp the environmental effects. This is, of course, the approach we’re taking with the Darwin’s Dogs project and its task of finding genes associated with different behavioral traits in dogs. The Working Dogs Project is very similar to Darwin’s Dogs, in fact, in its focus on behavioral traits. Darwin’s Dogs uses a massive number of survey questions from owners to characterize each dog’s behavior (thank you all so much for all of this data!). The technical term for this is “phenotyping” – describing the characteristics that we’re interested in (versus “genotyping,” describing the genetics that we will use in our analysis). Unlike Darwin’s Dogs, however, we can’t ask the trainers of working dogs to fill out a massive survey about their dogs. If we did, we’d get many fewer responses, and remember that a large sample size is one of our goals. (I like to say we want “zillions” of working dogs, while Elinor will simply say we want “all of them.”) We have to work with the data that the different training organizations already collect. This is the central challenge of the Working Dog Project. There are lots of different kinds of working dogs out there! Are the behaviors that make a dog a bad fit for a bomb sniffing job the same behaviors that make them a bad fit for a guide dog job? (Some behaviors yes, some no.) 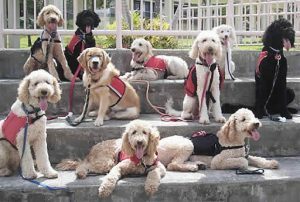 There are also a lot of different working dog training programs, and they all collect different data about their dogs. Can I compare these different pieces of data, or are they apples and oranges? My first job is to start learning about what kinds of data different groups collect, and try to make sense of it for a rigorous analysis. When it comes to collecting DNA samples from working dogs, we have a number of initial collaborators who have been great so far. The time will come when we will be finding other groups to help with this, once we have our feet under us a bit more. It’s a funny world, in which collecting and sequencing DNA isn’t the hard part of a project! Welcome to the Genomic Era. I would be remiss if I didn’t thank our funders. The Theriogenology Foundation and AKC Reunite have been very generous in supporting our first two years. Thank you so much to them. To stay in touch with the Working Dog Project, I encourage you to join our mailing list, which we will use to send out updates and to ask for working dog DNA samples when we’re ready for them. We’ll also let you know here on the Darwin’s Dogs blog what’s going on, of course. This week, we published a study where we identify genetic variants that are associated with human obsessive-compulsive disorder (OCD). 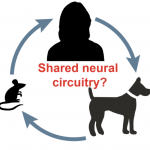 We used a new approach that combined information from studies in dogs and mice, as well as studies of autism in people (people with autism often show compulsive behaviors). Although we are still far from fully understanding the underlying causes and mechanisms of OCD, our study finds four genes where genetic mutations were more common in people suffering from OCD. Investigating the function of these genes tells us about the neurobiology of OCD, and may one day lead to new therapeutic targets. Here, I would like to share the backstory of our paper, to illustrate how we ended up utilizing dog genetics to guide human psychiatric research. As you may have seen in our previous blog posts, dogs are a great model for the study of behavior. They have evolved alongside us for thousands of years, helping us on various tasks like herding and hunting. Intriguingly, some dogs have behavioral disorders that share similarities with human psychiatric disorders, suggesting that research on those dog behavioral disorders might help to uncover the genetic basis of human psychiatric disorders. Many people have suggested that canine compulsive disorder (known as CCD) might be a natural model for human OCD. A natural model is an animal that exhibits a disease while living in their natural environment, and not as the result of human manipulation. Both dogs with CCD and people with OCD exhibit time-consuming, harmful repetitive behaviors, and both have partial improvements when treated with Prozac and other selective serotonin reuptake inhibitors. In 2010, we identified a region in the dog genome that is strongly associated with CCD (specifically, compulsive flank sucking or blanket sucking), by analyzing only 160 Doberman Pinschers. I say ‘only’ 160 dogs, because if we used the same method to study human OCD, we would have needed to analyze tens of thousands of human genomes – something no single study in psychiatric diseases had achieved at that time. Even today, such a large sample set has been achieved for only a few psychiatric diseases, and not for OCD. We followed up on that surprisingly successful study by looking at more dog breeds. In addition to Dobermans, we included German Shepherds, Shetland Sheepdogs, and Jack Russell Terriers. We found four genes that are influenced by genetic variants present only in dogs with CCD. None of the genes had been connected to OCD, but three (CDH2, CTNNA2, ATXN1) were known to be involved in human brain function. This suggested we were on the right track; studying CCD in dogs could also help us find genetic risk factors for OCD in humans. Up until this point, though, we had only studied dogs. In our new paper, we wanted to see whether what we learned from dogs might translate over to human. The answer ended up being a little complicated. Although we didn’t find exactly the same genes, we found genes that act in the same pathways. It’s almost like each species we study gives us just a few pieces of the puzzle, but by putting them together, we start to see the whole picture. In our new paper, we designed a genetic study of human OCD that interrogates 608 genes (about 1 out of every 30 genes) in OCD patients and healthy individuals. We selected the 608 genes based on our dog studies, as well as previous studies in mice and humans. We found four strongly associated genes: NRXN1, HTR2A, CTTNBP2, and REEP3. The most strongly associated gene, NRXN1, is also linked to autism, another disease with a repetitive behavioral component, like OCD. 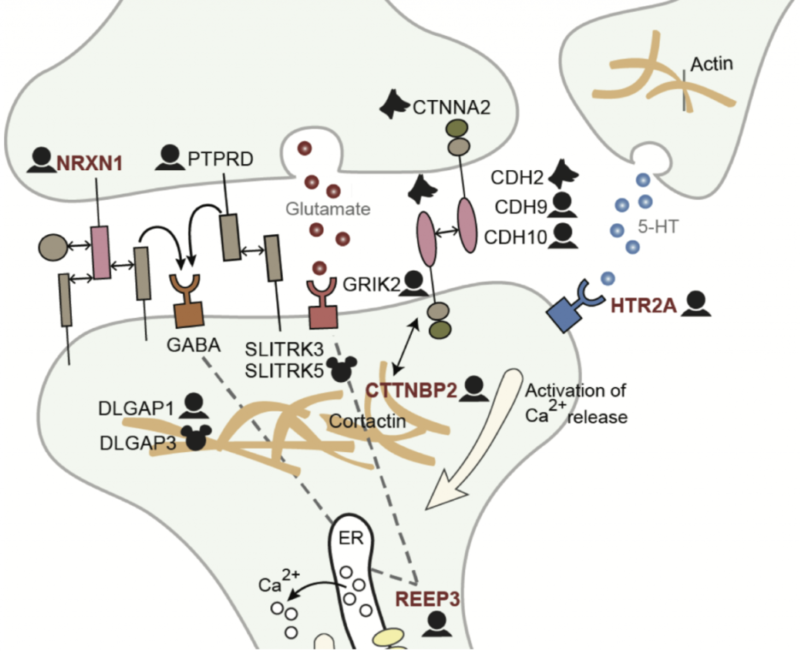 Interestingly, both NRXN1 (OCD-associated gene) and CDH2 (CCD-associated gene), encode proteins which hold the synaptic structure in the brain. Furthermore, the genes we found in our dog studies were also more strongly associated with human OCD, suggesting (although not conclusively showing) that people with OCD may be more likely to have changes in these genes too. This is only the beginning of this research. OCD and CCD are both complex diseases, and we think many, many more genes are probably involved, as well as environmental factors. We’re not even sure yet how genetically similar OCD and CCD are. To scale-up our approach, we are currently pursuing two parallel research efforts. First, through our Darwin’s Dogs research project, we are collecting dog DNA samples and detailed dog behavioral information from thousands of dogs, and this includes information on compulsive behavior. Second, we are part of the Nordic OCD & Related Disorders Consortium (NORDiC), which aims to collect the world’s largest richly phenotyped and genotyped sample of OCD cases from Nordic countries. By harnessing the power of two different species, we hope this research will one day lead to new and better therapies for both humans and our canine friends. Kathryn’s recent blog post about the critical period of socialization in dogs and wolves discussed the stark behavioral differences between these two subspecies of Canis lupus. Now, our work trying to uncover the genetic origins of these differences is beautifully described in a new article in the New York Times by James Gorman, with photographs and a cool new video of our work with wolf puppies and dog puppies. Wolves are not dogs, and my research is focused on figuring out why. A word about socialization and domestication. Socialization is the process by which animals develop social bonds during their lifetime, as they interact with others. Domestication, on the other hand, is an evolutionary process that involves changes in DNA and takes many, many generations. As a result of these genetic changes, the young of domesticated species, in contrast to their wild ancestors, are very easy to socialize with other species. Dog puppies learn, with little to no effort on our parts, to behave in a social manner with people, just by being around us. Though wolves have not been domesticated, they can also be socialized to people, but it is much, much harder. In order to be socialized, they must be in nearly constant contact with people starting before they are three weeks old, and continuing until they are at least 4 months old. Even after all that, they still need daily human contact throughout their lives to maintain this socialization. And, after all that, a socialized wolf is still not the same as a dog. 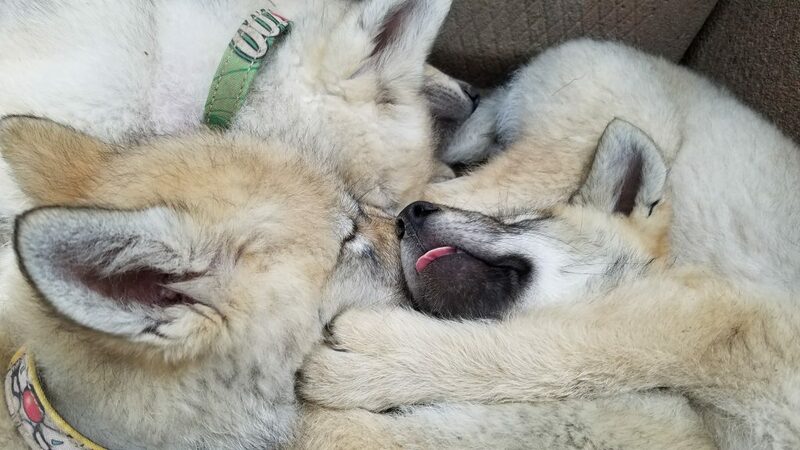 I learned first hand how different wolves are from dogs about thirteen years ago when I raised my first litter of wolf pups. One morning, I was confronted with a fierce bundle of fur. 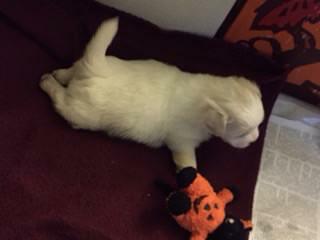 The tiniest pup, Luna, had found a small towel smelly with fish oil and she was guarding it ferociously. I knew I couldn’t just take her prize away from her. When I raise wolf pups, I’m very careful to make sure they connect me with good things, and taking a prized object from her could have damaged our new relationship. So instead, I traded. I grabbed the first thing I could find that I thought Luna would value above a stinky washcloth. I brought back a tin of sardines. First I threw a tiny piece of fish her way, but she flinched, growled, bared down harder on the towel and backed herself into a crate. In desperation, I showed her the entire tin of fish. Luna froze, looked at me out of the corner of her eye, dropped the towel and snapped at the sardines. I reflexively pulled my hand away and saw that she had taken the middles out of all of the fish! I grabbed the towel and shut the crate and left her to finish her prize. By the time I returned she was happy as ever to see me. 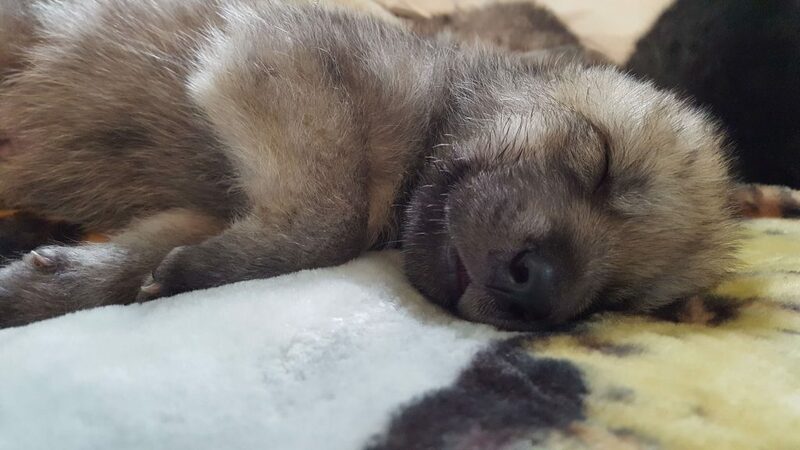 This ferocious wolf puppy was just 4 weeks old. Four-week old dog puppies have just barely started walking. Luna, at the same age, was far more agile than a dog puppy would ever be. This curious difference between dogs and wolves has been a major focus of my work ever since. By studying wolf puppies and dog puppies, I confirmed that wolves start walking and exploring at two weeks of age. In dogs, this is delayed until they are four weeks old. It turns out that this ability to actively explore marks the start of what we call the “primary critical period of socialization”. Dogs and wolves explore readily at the beginning of this period and are completely unencumbered by fear of new things. Fear gradually increases during this period until, about four weeks later, they will no longer approach new things. This is an incredibly important time in the life of a young animal because this is when they develop social bonds with other animals. 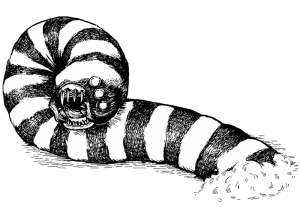 While this is usually with other members of their own species, they will also bond with people, if we are around. This difference in timing, from 2 weeks old in wolves to 4 weeks old in dogs, doesn’t seem like it would be a big deal. After all, the critical period of socialization still lasts for 4 weeks in both wolves and dogs. In fact, it dramatically changes the early experience of dogs and wolves. This is something I also first noticed in Luna and her siblings. I usually play music in the background when I am raising dog pups. When their ears open, at about three weeks old, it helps them get used to different sounds with the absence of any fear. When I did the same thing with Luna and her siblings, they were terrified! It was exactly the same thing with the sound of my voice. What was their response so completely different? It turns out that, while dogs and wolves start hearing at the same age, wolves at that age have already entered that “primary critical period of socialization”. They have already started to explore the world, and begun to develop fear of new things. 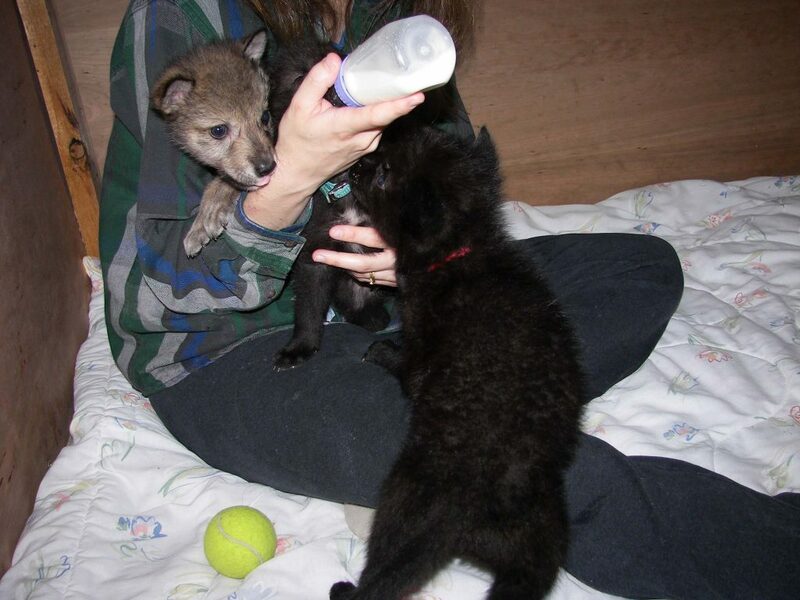 When those three week old wolf pups first heard me speak, it was a brand new sound, and it was extremely scary to them. Once I breathed on their faces, though, and they smelled me, they recovered quickly. They knew my smell, and could attach the familiar smell of me with the new sound of me. We could continue the process of socialization without being inhibited by fear. This small shift in timing could be one of the most important differences between wolves and domesticated dogs. Dog puppies can smell, hear and see before they start their critical period of socialization. That makes it much easier for dogs to form social bonds with people. Any time spent with people between 4 and 8 weeks provides a complete sensory experience. For wolves, this diverse sensory information is provided slowly over time and inhibited by fear. Because they start the critical period of socialization when they are still blind and deaf, they rely mostly on their sense of smell to determine what is familiar and what is novel. While they can be socialized to particular people, they have a hard time generalizing this socialization to all people. Luna and her siblings were socialized primarily by myself and another woman, and we tried to have many different kinds of people visit them. Still, when they met their new caretaker, a tall bald man who was pretty much the physical opposite of me, they found him very alarming. We’re just starting to really figure out why wolves are so different than dogs, but we certainly understand that they are! Despite all of your hard work socializing a wolf puppy, it’s still far more fearful of new things than a dog, and will always be “wolfy” in other ways: more inquisitive, more “street smart,” more destructive, and more dangerous to other members of the household, including pets, children or even adults with whom they are socialized, than a dog. 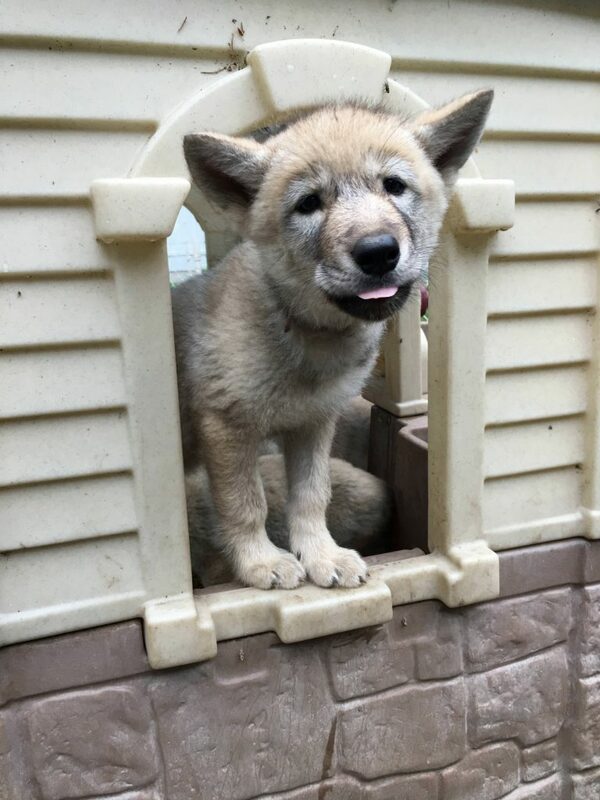 So next time you see a picture of a wolf puppy, appreciate how adorable is it, and then go thank your dog for being such a friendly, easy companion! We’re not just a pretty (fuzzy, barking) face! Our research group at the Broad Institute and the UMass Medical School doesn’t focus solely on dogs — we study other animals as well. We have worked on many animal genetics projects in the past, from horses to lizards, “living fossil” fish, and even sea slugs! Each project is unique, gives us the opportunity to work with researchers from around the world, and informs and highlights very different aspects of biology. Currently, we are working on a very large-scale project to compare the DNA of over 200 different mammals! Even though 199 of the species in this project are not humans, the primary goal is to develop a deeper understanding of human health and disease. 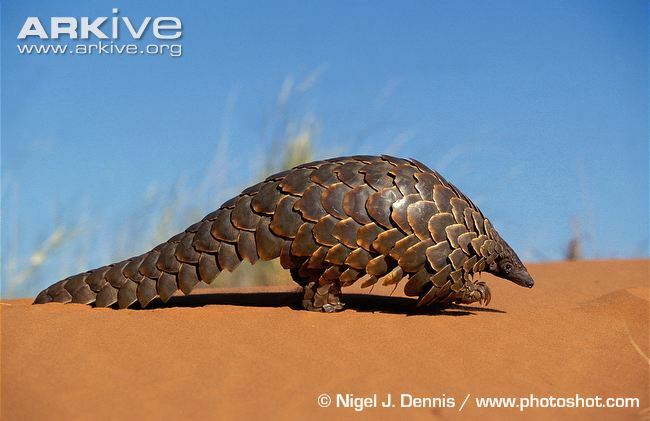 How does studying the DNA of armadillos, elephants, and aardvarks help us with human health? By looking at which parts of the DNA are more similar than we would expect from chance, we can judge the importance of those parts of DNA. If a region of DNA is very similar in aardvarks and humans, we can assume that it performs a function that cannot tolerate evolutionary change. We expect to add to our understanding of how all the parts of our DNA work together, not just the genes. Genes only make up about 5% of the DNA, other parts contain “regulatory elements,” which control which genes get turned on or off, and understanding all the aspects of how DNA functions is key to understanding how life works! Our work to examine DNA from such a large group of mammals is possible only because of the heroic efforts of our collaborators in San Diego. They have created “banks” of DNA samples from a huge number of species. Indeed, approximately 50% of our samples came to us from one small fridge at the San Diego Zoo! Technological advancements made over just the past few years have been essential in allowing us to examine and compare these DNA samples from such a large and diverse group of mammals. Happy New Year from the Karlsson Lab! We began 2016 as a little group with big ideas for the future of science. In addition to our ongoing work on infectious diseases, our citizen-supported research project “Darwin’s Dogs” had just launched, and we were eager to see how it would be received. Now, as we greet 2017, we find ourselves having become not quite so little. Over the past year, we’ve welcomed the Broad’s Vertebrate Genomics group, added our first three graduate students, and signed up nearly 12,000 Darwin’s Dogs. 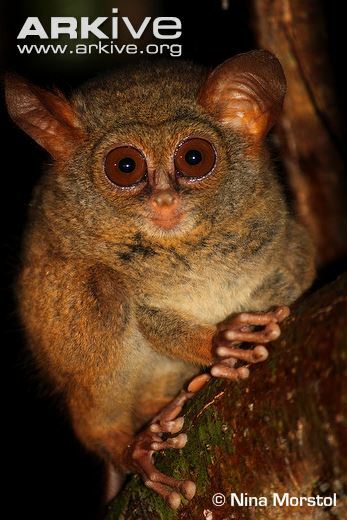 The number of species we study has grown by nearly 100 fold, and now covers everything from the Aye-aye to the White Rhino (we should really consider adding a Zebra). Meanwhile, our dog-owning citizen scientists have answered over one million survey questions. As we look back over the last year, we are incredibly grateful to everyone who has helped and supported us in this transition. We have experienced collaborative science at its very best. In this year’s card, we pay homage to the scientists and explorers that came before us, and on whose shoulders we stand. As we venture forth into a new year of discoveries, may we continue in their intrepid spirit. P.S. You can sign your dog up – whether purebred or pure mutt – at DarwinsDogs.org!